Watercolor workshop attendees often meet outdoors to paint plein air pictures and discuss advanced watercolor painting techniques. 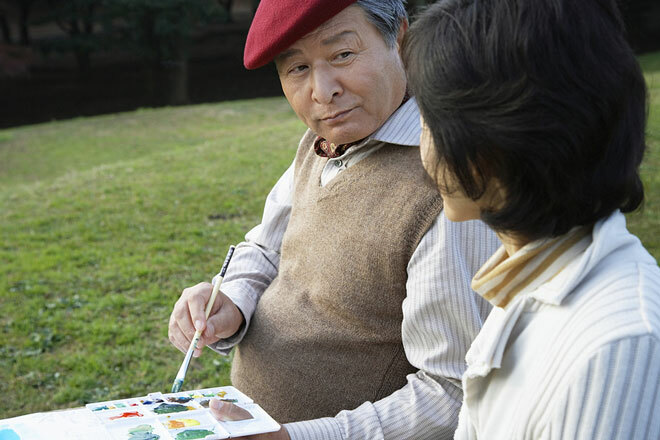 Get the Latest Art Workshops on Watercolor, Acrylic & Oil Painting. Instruction From Top Artists Charles Reid, Nita Leland, Richard McKinley & More. Cloudcroft Art Workshops features artists from all over the country offering art instruction in many different art techniques and mediums. Darlene Kaplan is a watercolor artist that uses watercolor minerals and ink on acid free rice paper. Watercolor artist and journal keeper. Watercolor workshops, book author, DVD workshop series. George James has an experimental watercolor approach using both synthetic paper and traditional watercolor media. Watercolor artist, teacher, and author. Watercolor workshops available. Award-winning artist, workshop instructor, and book publisher. This AWS, NWS artist has won numberous awarks for her transparent watercolor paintings. Karin is a watercolor artist who paint colorful, realism paintings. Both still life and portrait paintings interest her. Watercolor artist, author, and workshop conductor. Author of Watercolor Depth and Realism. Art school located on Whidbey Island in Washington State. Hold workshops each year. A member of the AWS and the NWS, Robert OBrien creates light in his watercolor paintings through the use of shadow. He focuses on landscape and architectural studies. Roland Lee is known for his transparent watercolors of the southwest landscape, the pioneer west, and rural European scenes. Internationally known for watercolors and oils. Scott Moore Watercolor Workshops, Laguna Beach. Stephen Quiller is known for color, color theory, and his approach to watermedia painting. He gives workshops, and has books and artists materials. Sterling Edwards is an artist who has designed a palette for large brushes. He has a collection of DVDs and teaches workshops.